by Dr. Steven Brown, D.Div. and Dr. Linda Smallwood, BBS, M.Min., D.Min. Interesting question, especially since this study is supposed to be about Jesus as High Priest. However, since God's Word tells us Jesus is "a priest forever after the order of Melchizedek" (Psalm 110:4; Hebrews 6:20), it is incumbent upon us to learn what we can about Melchizedek. The name "Melchizedek" or "Malki Tzedek" derives from two Hebrew words malk-i and sédeq or tsedek. Malk-i means "my king" and sédeq or tsedek means "righteous". Melchizedek is first mentioned in Scripture when, as king of Salem1 and Priest of "God Most High" [El 'Elyon], he greets and blesses Abram with bread and wine. "And Melchizedek king of Salem brought out bread and wine. (He was priest of God Most High.) And he blessed him [Abram] and said, 'Blessed be Abram by God Most High, Possessor of heaven and earth; and blessed be God Most High, who has delivered your enemies into your hand!' And Abram gave him a tenth of everything." (Genesis 14:18-20) This is the first tithe recorded in Scripture, which by the way, happens to be many centuries prior to God giving the Law to Moses in which He required a tithe. Beyond those introductions and a few other scattered references to him, Scripture tells us very little while at the same time, presuming our understanding. Perhaps you have discussed the subject of Melchizedek, as he pertains to the eligibility of Christ for the Priesthood. I personally also had some questions about this somewhat mysterious biblical character, so I began an earnest effort to research him. The identity of Melchizedek has been the subject of much debate over the centuries. Some have claimed he was a theophany [a visible manifestation of God to a human being]; others say he was a literal human being, an angel, the pre-incarnate Christ, or Shem [as we noted above]. Melchizedek's full identity is one of the wonderful mysteries of the Word of God, just like Elijah's disappearance into the whirlwind, and the mysteries surrounding the "Angel of the Lord". More than likely, despite all of our mortal efforts, we will never truly receive the definitive answers to these biblical mysteries until we are blessed to receive them personally, face-to-face with our Savior. As one person observed: "The Bible doesn't tell us all there is to know, but it tells us all we need to know." In any discussion about Jesus as High Priest, it is important to study His genealogical record (cf. Matthew 1:1-16; Luke 3:23-38). As you may know, Matthew's record begins with Abraham and ends with Jesus. Luke's record, however, begins with Jesus and ends with Adam, "the son of God" (Luke 3:38). The two genealogical records are obviously different from one another, not just in who's listed first and last, but in the names in the records. This is because Matthew traces Jesus' genealogy through his earthly father, Joseph, whereas Luke traces His genealogy through Mary, both of which prove Jesus is a descendent of King David, a requirement for the Jewish Messiah. The inclusion of Mary, as well as six other women in biblical history, was a very significant matter in the genealogy of Jesus. This mention of them in a long list of men was not a common occurrence in Jewish tradition. However, Jesus Himself also appeared to be a real advocate for women during His earthly ministry. Technically, Jesus Could Not Be "High Priest"
Jesus was born and raised a Jew, and He was often called "Rabbi" or "Teacher". Although these positions were well-regarded in the communities and regions where Jesus ministered, He was, and is, much more than those titles imply. He is God! But even His closest friends had difficulty comprehending this through their mortal understanding. Not only did the Jews not recognize Jesus as the Messiah, but they also would never have considered Him as "High Priest". The reason: According to strict legalistic Judaism, Jesus was not eligible for the priesthood, since He was not a descendant of Levi, which could have made Him eligible for the Levitical priesthood. "Behold, I have taken the Levites from among the people of Israel instead of every firstborn who opens the womb among the people of Israel. The Levites shall be mine, for all the firstborn are mine. On the day that I struck down all the firstborn in the land of Egypt, I consecrated for my own all the firstborn in Israel, both of man and of beast. They shall be mine: I am the LORD." (Numbers 3:12-13). If He's Not Eligible, How Can He be Our High Priest? If the Jews had known their own Scriptures and not been so offended by the Messiah in their midst, they would have understood the prophetic foreshadowing of the Messiah's eternal High Priesthood in the order of Melchizedek. "The LORD has sworn and will not change his mind, 'You are a priest forever after the order of Melchizedek.'" (Psalm 110:4). Now, it's time to dig deeper into who this person Melchizedek was and what Scripture means when it says Jesus is high priest "after the order of...". As we learned in "Studying the Bible", it is important to study Scripture in its context, that is, to study what precedes a passage and what follows it. In this case, in order to construct a solid framework on which to build Jesus' priesthood, we'll start with the 6th chapter of Hebrews. 15And thus Abraham, having patiently waited, obtained the promise. 16For people swear by something greater than themselves, and in all their disputes an oath is final for confirmation. 18so that by two unchangeable things, in which it is impossible for God to lie, we who have fled for refuge might have strong encouragement to hold fast to the hope set before us. The Contemporary English Version (CEV) reads: "Jesus has gone there ahead of us, and he is our high priest forever, just like Melchizedek." The Complete Jewish Bible (CJB) reads: "where a forerunner has entered on our behalf, namely, Yeshua, who has become a cohen gadol forever, to be compared with Malki-Tzedek." The Good News Bible (GNB) reads: "On our behalf Jesus has gone in there before us and has become a high priest forever, in the priestly order of Melchizedek." God's Word (GW) reads: "where Jesus went before us on our behalf. He has become the chief priest forever in the way Melchizedek was a priest." In other words, God Himself ordained Jesus as a High Priest in the same way that He ordained Melchizedek for specific reasons, which we will see as we continue to review the book of Hebrews. We will also see that the order of Melchizedek is superior to the Levitical order in the same way that Jesus is superior to the angels and all forerunners, and His name is above all names. He is Lord of all, Savior and God! 2and to him Abraham apportioned a tenth part of everything. He is first, by translation of his name, king of righteousness, and then he is also king of Salem, that is, king of peace. 3He is without father or mother or genealogy, having neither beginning of days nor end of life, but resembling the Son of God he continues a priest forever. 4See how great this man was to whom Abraham the patriarch gave a tenth of the spoils! 5And those descendants of Levi who receive the priestly office have a commandment in the law to take tithes from the people, that is, from their brothers, though these also are descended from Abraham. 6But this man who does not have his descent from them received tithes from Abraham and blessed him who had the promises. 7It is beyond dispute that the inferior is blessed by the superior. 8In the one case tithes are received by mortal men, but in the other case, by one of whom it is testified that he lives. 10for he was still in the loins of his ancestor when Melchizedek met him. 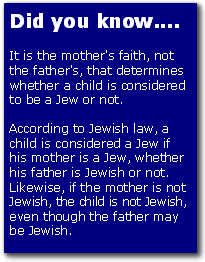 12For when there is a change in the priesthood, there is necessarily a change in the law as well. 13For the one of whom these things are spoken belonged to another tribe, from which no one has ever served at the altar. 14For it is evident that our Lord was descended from Judah, and in connection with that tribe Moses said nothing about priests. 16who has become a priest, not on the basis of a legal requirement concerning bodily descent, but by the power of an indestructible life. 19(for the law made nothing perfect); but on the other hand, a better hope is introduced, through which we draw near to God. 24but he holds his priesthood permanently, because he continues forever. 25Consequently, he is able to save to the uttermost those who draw near to God through him, since he always lives to make intercession for them. 26For it was indeed fitting that we should have such a high priest, holy, innocent, unstained, separated from sinners, and exalted above the heavens. 27He has no need, like those high priests, to offer sacrifices daily, first for his own sins and then for those of the people, since he did this once for all when he offered up himself. Please take a few moments to pause and reflect on these passages. In particular, notice those which we have emphasized. Don't pass over them too quickly, but ask the Holy Spirit to guide and enlighten your understanding. What the first six verses tell us is that the priestly line of Levites, who are descendants of Abraham, collect a tithe from the children of "the promise", that is, the promise God made to Abraham to bless and multiply him. Now, if these descendants of Abraham are required to pay a tithe to the Levite priesthood, how much greater must the Priest be to whom Abraham himself paid a tenth of his spoils! Certainly, verse 7 sums it up beautifully: "...the inferior [Levite priesthood] is blessed by the superior [Melchizedek]." Jesus Is Not Only "KING of Kings"; He is also "PRIEST of Priests"! And now comes the climax in chapter 8! 2a minister in the holy places, in the true tent that the Lord set up, not man. 3For every high priest is appointed to offer gifts and sacrifices; thus it is necessary for this priest also to have something to offer. 4Now if he were on earth, he would not be a priest at all, since there are priests who offer gifts according to the law. 6But as it is, Christ has obtained a ministry that is as much more excellent than the old as the covenant he mediates is better, since it is enacted on better promises. 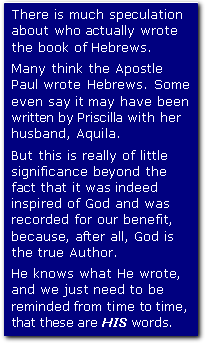 The Apostle John tells us Jesus existed before Creation (cf. John 1:1-3), which means that as the Son of God . . . as the Word . . . and as the life which was "the light of men", He naturally goes between Adam and God. Who is that person who "goes between" sinful man and God in the Old Testament? The Priest. Melchizedek was appointed "Priest of God Most High" . . . by God. And this well before Levi was even born, let alone him and his descendants being appointed by God to the priesthood! And yet, the Jews recognized Melchizedek, not only as "High Priest", but as a High Priest superior to the Levitical priesthood! Therefore, when the writer to the Hebrews said Jesus was a "high priest forever after the order of Melchizedek", he was acknowledging that Jesus, the Son of God, was and is eligible for any priesthood, anytime, anyplace, and in any way He wants to be! Melchizedek was also the only Priest who was also a king, as is our "High Priest". As my mind continued to dwell on this "man" Melchizedek, I felt that the Holy Spirit gave me the answer I needed . . . not a complete or extra-Biblical revelation . . . but an answer I could live with . . . spiritually . . . a gift from the Holy Spirit of God. 1Salem n.  [also known as Shalom] peace, commonly supposed to be another name of Jerusalem.